Recap: Days 3 & 4 of the Christopher Plummer Movie Blogathon! The Christopher Plummer Movie Blogathon continues rolling along! Today is now Day 4 of the blogfest, and I’ve got a lot of catching up to do, as my film blogger friends have been very busy! Last night I posted my own analysis of one of my favorite Christopher Plummer films, Dolores Claiborne. But here’s what the rest of the gang has been up to. Psychiatry is a relatively new discipline in medicine which has evolved quite rapidly. The mainstay of therapy less than a century ago was institutionalization. This method can undoubtedly isolate individuals, creating a deeper microcosm. Care evolved to include various surgeries and treatments that are recognized today as ineffective and some inhumane. While not perfect by any stretch, mental health care is now ideally multidisciplinary. Medications, counselling methods, and assertive community treatment (ACT) teams are among the resources used to help ensure optimal functioning in the daily lives of those living with mental illness. Integral to that piece is a caring, patient, and resilient psychiatrist, complementing holistic care and involving patients and families in decision-making. While set in the 1950s at the dawn of antipsychotic medications, Dr. Rosen (Christopher Plummer) exemplifies these essential qualities in A Beautiful Mind (2001) directed by Ron Howard. My Take on it – I have always enjoyed historical fiction dramas and ones that revolve around the events in Europe during World War II have always fascinated me. 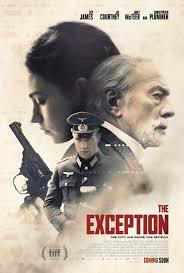 This film is probably not that close to what really happened at the estate of former Kaiser Wilhelm II in Belgium, but it still is quite an entertaining story nevertheless mainly because it shows us good people in bad situations that strive to come out of it all as clean as possible. The cast is superb and they do a wonderful job keeping things feeling real yet extremely tense because you never really know what will happen. Christopher Plummer stands out among them all as the former Kaiser and as always, he yet again gives an amazing performance to add to his already long list of them on his resume. Wonderful blogs the past few days! Thank you to everyone who’s participated thus far. This is already the most successful blogathon I’ve ever done, and there are still three more days to come. The header image (from Starcrash) and other images in this article are presumably copyrighted by the owners of the pictures involved. I believe my inclusion of them here is permissible under fair use. I am not the uploader of the YouTube clip embedded here.